Welcome to ISACA MACAO Chapter! Jointly organized by Computerworld Hong Kong and Macao Computer Society, the "Macau CIO Leadership Forum 2011" is going to be held in Macau Tower Convention and Entertainment Centre on 8th September 2011 (Thursday), at 9am to 5pm. ISACA Macao Chapter is invited to be the supporting organization for this event. The Macau CIO Forum 2011 is a unique gathering in Macau aimed squarely at current CIOs, heads of IT and technology and crucially those that aspire to lead IT. The forum aims to address the unique challenges faced by each of these CIO roles and provide leading insight on how to deliver on the individual and organization goals that are expected of CIOs today. · Exploring the business value of IT - From aligning IT with business to merging IT with business. · The need to add flexibility, greater performance and up-skilling IT organization, a volatile level of infrastructure expansion in the gaming/hospitality space. · New ways to manage and deliver IT: cloud, multi-sourcing, intelligent platforms, social web and mobile network. · Providing the technology roadmap to allow IT teams to develop from manage-and-maintain to agents for change and innovation. · Special industry focus on booming sectors in Macau. 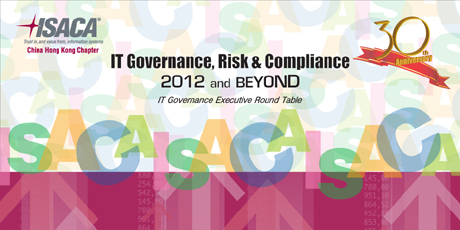 ISACA China Hong Kong Chapter has organized its ISACA IT Conference themed “IT Governance, Risk and Compliance: 2012 and Beyond” to be held on 15 March, 2012 at Regal Hong Kong Hotel. ISACA Macao Chapter is honored to be invited as one of the supporting organizations for this event. The conference is designed for senior IT, Governance and Risk Management leaders like you who are seeking to strengthen your organizations by developing strategies for effective integration of business and technology. Jointly organized by Computerworld Hong Kong and Macao Computer Society, the "Macau ICT Forum 2012" is going to be held in Macau Tower Convention and Entertainment Centre on 25th April 2011 (Wednesday), at 9am to 4:30pm. ISACA Macao Chapter is invited to be the supporting organization for this event. The Macau ICT Forum 2012 is a unique gathering in Macau aimed squarely at senior IT management and business managers from various booming industries. The Forum is where enterprise tech decision makers gain the knowledge, tools and insight required to lead IT in 2012 and beyond. Exploring the business value of IT—From aligning IT with business to merging IT with business. The need to add flexibility, greater performance and up-skilling IT organization, a volatile level of infrastructure expansion in the gaming/hospitality space. New ways to manage and deliver IT: cloud, multi-sourcing, intelligent platforms, social web and mobile network. Providing the technology roadmap to allow IT teams to develop from manage-and-maintain to agents for change and innovation. Jointly organized by Computerworld Hong Kong and Macao Computer Society, the "Macau CIO Leadership Forum 2012" is going to be held in Macau Tower Convention and Entertainment Centre on 26th June 2012 (Tuesday), at 9am to 4:20pm. ISACA Macao Chapter is invited to be the supporting organization for this event. The Macau CIO Forum 2012 is a unique gathering in Macau aimed squarely at current CIOs, heads of IT and technology and crucially those that aspire to lead IT. The forum aims to address the unique challenges faced by each of these CIO roles and provide leading insight on how to deliver on the individual and organization goals that are expected of CIOs today. 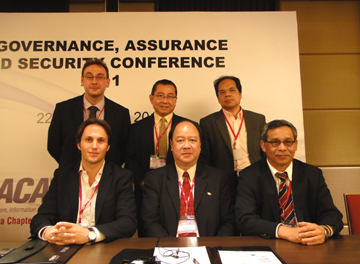 Organized by ISACA Malaysia Chapter and Malaysian National Computer Confederation (MNCC), ISACA/MNCC: IT Governance, Assurance and Security Conference 2011 was held on 22nd-23rd June 2011 at the One World Hotel KL, Malaysia. Representative from ISACA Macao Chapter, President Geoffroy Thonon, was invited to keynote speech titled “Pr[a,e]ying on Trust”. The day finished with a panel of discussion to provoke thoughts on "Social Networking: The Latest, greatest business tool or the Chief Security Officer's nightmare?". Through the interaction with the Malaysian counterparts for ISACA as well as computer emergency response teams (MyCERT), a closer collaboration and understanding was able to be established to share ideas and synergise efforts for IT Governance, Assurance and Security. 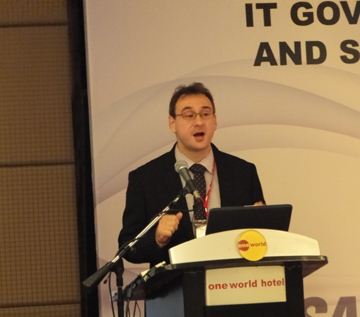 Mr. Geoffroy Thonon, President of ISACA Macao Chapter delivered the speech. Group picture of Mr. Geoffroy Thonon and other panelists.